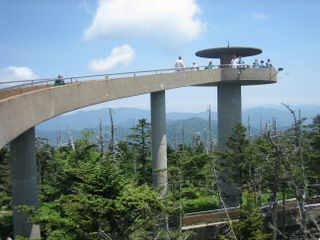 Clingmans Dome is the highest peak in the Great Smoky Mountains. At 6,643 feet above sea level, it is the 3rd highest peak east of the Mississippi. An observation tower at the top provides a spectacular 360 degree panoramic view of the park. Clingmans Dome is one of the more popular spots in the Smokies. But the large parking area, wide trail, and restrooms are sufficiently large to handle the crowds. 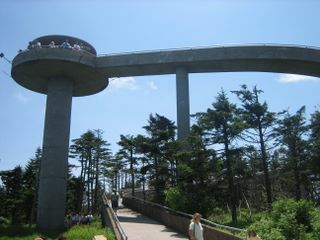 The observation tower at Clingmans Dome is open to the public and is accessible by a 1/2 mile paved hiking trail. The tower provides an amazing 360 degree panoramic view of the Smokies. On a very clear day, you can see over 100 miles. However, most days, due to fog, clouds, and haze, the view is much shorter. Clouds and rain are very common and can limit the view to almost 0 some days. Clouds sometimes move in and out quickly, so if you stay for a while, the view may change rapidly. Clingmans Dome is one of the best places in the Smokies to watch a sunrise or sunset. In late June and early July, the flame azaleas are in bloom, especially at Andrews Bald. October is a good time to see the fall colors anywhere in the park. Colors start to change earlier in the higher elevations, making early to mid October the best time to see the fall colors at Clingmans Dome. July and August are the hottest months in the Smokies. Hiking in the lower elevations can be hot and humid. The temperature at Clingmans Dome generally runs 10-20 degrees cooler than the lower elevations. Because of the high elevation at Clingmans Dome, the temperatures run 10-20 degrees colder than the lower elevations. The table below shows the average temperature and snowfall at Clingmans Dome. 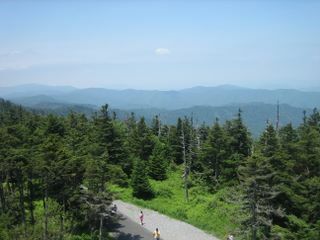 Clingmans Dome offers several hiking trails. 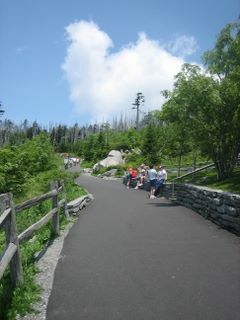 The 1/2 mile paved trail leading to the observation tower is by far the most popular trail here. The trail is wide and well maintained. Since it is paved, you can push strollers or wheelchairs up the trial. It is a very steep trail, making it a little more difficult of a hike than it first appears. The trail begins at the parking area. If you want to reach the observation tower, but avoid the crowds, take the Forney Ridge Trail which branches to the left off of the paved trail. Look for a sign on the left for the Forney Ridge trail. From the Forney Ridge trail, follow signs to the Appalachian Trail. Andrews Bald is a great hike from Clingmans Dome. The 3.6 mile round trip hike follows the Forney Ridge trail to Andrews Bald. Parts of trail are very Rocky, and the beginning of the trail can be very wet if it has rained recently. Silers Bald is an 8 mile round trip hike from Clingmans Dome along the Appalachian Trail. Clingmans dome does not have a developed picnic area. There are no picnic tables or grills. However, there are plenty of great places to spread out a blanket and enjoy a picnic with a great view. The grassy area at the entrance to the parking area is a good spot for a picnic. If you feel like carrying your food about 2 miles, Andrews bald is a magnificent spot for a picnic. Restrooms with running water and flush toilets are available near the start of the trail to the observation tower. Take U.S. Highway 441 (Newfound Gap Road), which runs through the national park from Gatlinburg, TN to Cherokee, NC. Newfound Gap is about 1/2 way between Gatlinburg and Cherokee. The Clingmans dome road starts 0.1 mile south of Newfound Gap. Follow Clingmans Dome road 7 miles until it dead ends into the Clingmans Dome parking area. It is about 25 miles to Clingmans Dome from Gatlinburg or Cherokee. Clingmans road is closed in the winter from December 1st until March 31st. Click [Map] to view normal map, [Satellite] to view satellite image, or [Hybrid] to show both the map and satellite views. Double click on a spot to re-center the map at that point. 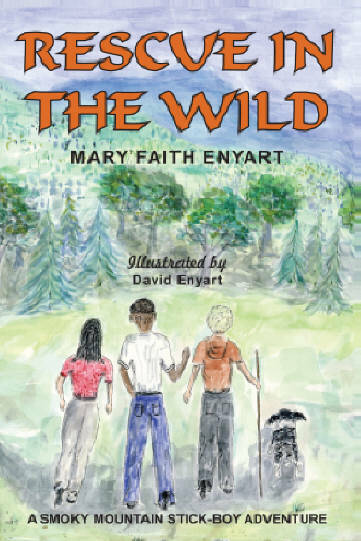 Rescue in the Wild is a wonderful children's novel set in the Great Smoky Mountains National Park. It is a fictional book, but gives great information about the national park while telling an entertaining story. Great Smoky Mountains: A Vistor's Companion describes and illustrates in full color dozens of plant and animal species in the Smokies, including a wide variety of birds, reptiles, amphibians, fish, mammals, and plants. It also explores the park's geology, climate, and history. Clingmans Dome / Cataloochee, Great Smoky Mountains National Park Trails Illustrated Map is a great map of the clingmans dome and cataloochee areas. The National Geographic Trails Illustrated Maps are some of the best trail maps of any area.